We've gone through many a cat bed in our house. We've tried them all, from the flimsy doughnuts with no padding on the bottom to the expensive raised beds with cubbies underneath. None have been outright rejected, though several came in boxes that were ultimately more interesting than the beds they contained. This time, we bought four beds - one for each cat - and all four have been inhabited ever since. Pretty good for a reasonably-priced AmazonBasics product. The bed is a generous 20" in diameter. It has polyester canvas outer sides and bottom and fleece-like upper sides and top. The padding is soft and pillowy, and there's plenty of padding on the bottom of the bed. These are plush! There are even seams on the bottom to keep the padding from moving around inside the bed. The only negative is the fabric bottom. 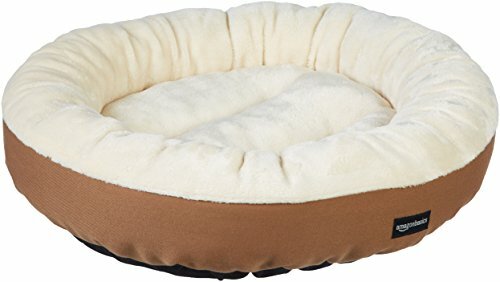 Many pet beds have rubberized or textured bottoms to keep them from slipping around on smooth surfaces. Not so on this bed. If you put it on a smooth surface like a hardwood floor, it can slide around pretty easily. That said, we've had no issues with ours so far. At least the cats aren't playing air hockey with them yet. Part of that is due to the size of the bed. Weighing in at a little over one pound means that it mostly stays put unless a cat launches out of it suddenly. We appreciate that these beds can be machine washed. One of ours has already weathered a small bout of regurgitation and it came through with flying colors. All in all, these are a great bargain and come highly recommended. Oh, and the boxes they came in were big hits too!